Hi there! Today we will detail a recent study by Jessica Agarwal and Michael Mommert, entitled Nucleus of active asteroid 358P/Pan-STARRS (P/2012 T1). This study has recently been accepted for publication in Astronomy and Astrophysics, and consists in increasing our knowledge of a recently discovered object, i.e. P/2012 T1. This object proved to have some activity, like a comet. The authors realized several observations to try to characterize its activity, and infer some physical properties like its size and its rotation. First of all, I would like to make clear what is a comet, and what is an active asteroid. I am very ambitious here, since these two notions actually overlap. For instance, our object is both an active asteroid, and a main-belt comet. Let us say that a comet is an active asteroid, while an active asteroid is not necessarily a comet. The difference is in the nature of the activity. A comet is a dirty snowball, i.e. you have water ice, and some silicates. Its orbit around the Sun is usually pretty eccentric, so that you have large variations of the distance Sun-object. The location of the orbit, at which the distance is the smallest, is called pericentre. When the comet approaches the pericentre, it approaches the Sun, heats, and part of its water ice sublimates. This results in a dusty tail (actually there are two tails, one being composed of ionized particles). But when you see dust around a small body, i.e. when you see activity, this is not necessarily ice sublimation. There could be for instance rock excavated by an impact, or material expelled by fast rotation. In that case, you still have an active asteroid, but not a comet. One of the goals of this study is to address the cause and nature of P/2012 T1’s activity. 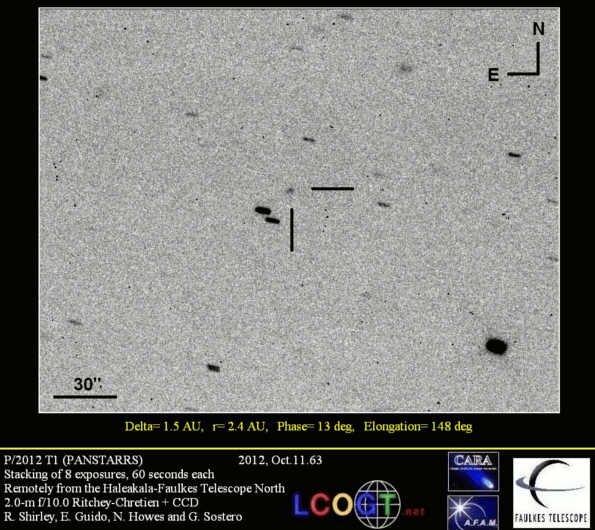 P/2012 T1, now named 358P, has been discovered in October 2012 by the Pan-STARRS-1 survey. Pan-STARRS stands for Panoramic Survey Telescope and Rapid Response System, it uses dedicated facilities at Haleakala Observatory, Hawaii, USA. Its provisional name, P/2012 T1, contains information on the nature of the object, and its discovery. P stands for periodic comet, 2012 is the year of the discovery, and T means that it has been discovered during the first half of October. 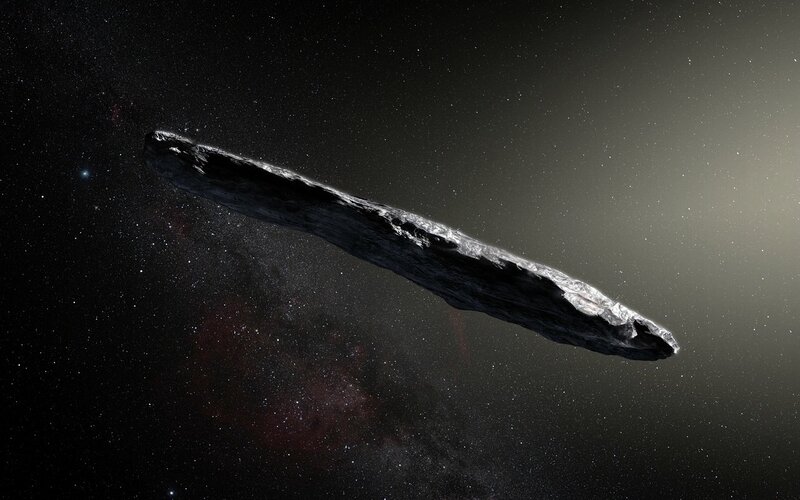 Interestingly, this object appeared on images taken in December 2001 at Palomar Observatory in California, while acquiring data for the survey NEAT (Near-Earth Asteroid Tracking). From its orbital dynamics, it is a Main-Belt object. As a comet, it is a Main-Belt Comet. Once an object is known and we know where it is, it is much easier to reobserve it. The authors conducted observations of 358P from the Southern Astrophysical Research (SOAR) telescope, and the Very Large Telescope. The SOAR telescope is based on Cerro Pachón, Chile. This is a 4.1-m aperture facility, located at an altitude of 2,700 m. The authors took images with the Goodman High Throughput Spectrograph during one night, from July 27 to July 28, 2017. They wanted to analyze the reflected light by the asteroid at different wavelengths, unfortunately the observational constraints, i.e. cloud coverage, permitted only two hours of observations. Only the observations made with the VR filter, centered at 610 nm, were useful. These data were supplemented by 77 images taken during 10 hours from August 17 to August 18, 2017, at the Very Large Telescope. This instrument depends on the European Southern Observatory (ESO), and is located on Cerro Paranal, once more in Chile, at an altitude of 2,635 m. The authors used the FOcal Reducer and low dispersion Spectrograph 2 (FORS2), which central wavelength is 655 nm. The observations give raw images. The authors treated them to get reliable photometric and astrometric measurements of 358P, i.e. they corrected from the variations of the luminosity of the sky, in using reference stars, and from the possible instrumental problems. For that, they recorded the response of the instrument to a surface of uniform brightness, and used the outcome to correct their images. Let us now address the results. Such a small (sub-kilometric) body is not spherical. This results in variations of luminosity, which depend on the surface element which is actually facing your telescope. If you acquire data during several spin periods of the asteroid, then you should see some periodicity in the recorded lightcurve. The best way to extract the periods is to make a Fourier transform. Your input is the time-dependent lightcurve you have recorded, and your output is a frequency-dependent curve, which should emphasize the periods, which are present in the recorded lightcurve. If the signal is truly periodic, then it should exhibit a maximum at its period and its harmonics (i.e. twice the period, thrice the period, etc. ), and almost 0 outside (not exactly 0 since you always have some noise). In the case of 358P, the authors did not identify any clear period. A maximum is present for a rotation period of 8 hours, but the result is too noisy to be conclusive. A possible explanation could be that we have a polar view of the asteroid. Another possibility is that the albedo of the asteroid (the fraction of reflected light) is almost uniform. The authors tried to detect debris around the nucleus of the comet, in widening the aperture over which the photometry was performed. They got no real detection, which tends to rule out the possibility of non-cometary activity. Finally, the magnitude of the asteroid is the one of a sphere of 530 meters in diameter, with an albedo of 6%. This means that a higher albedo would give a smaller size, and conversely. 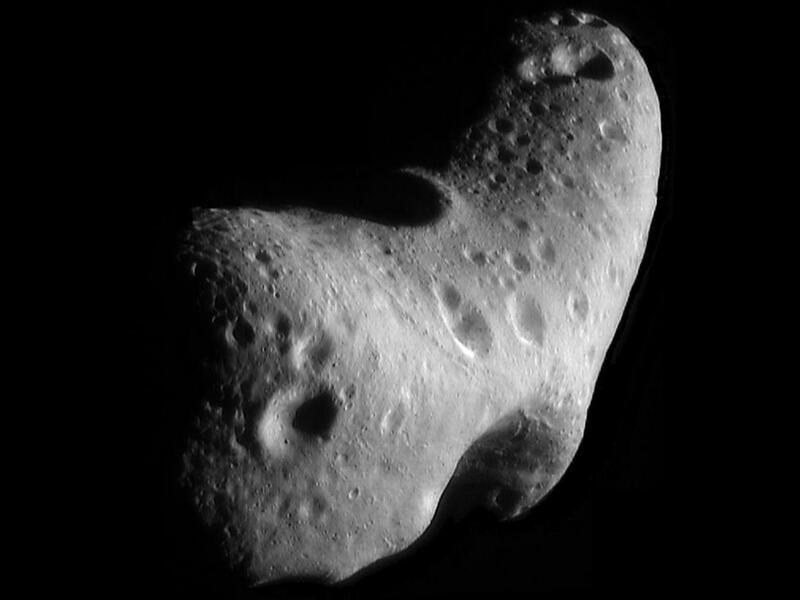 The albedo depends on the composition of the asteroid, which is unknown, and can be only inferred from other asteroids. The authors assumed it to be a carbonaceous asteroid (C-type), as 75% of the asteroids. If it were an S-type (silicateous) body, then it would be brighter. A wide band spectrum of the reflected light would give us this information. You can find the study here, on Astronomy and Astrophysics’ website. Moreover, the authors uploaded a free version on arXiv, thanks to them for sharing! and here the website of Michael Mommert. Hi there! Everybody knows the comets, which may show us impressive tails, when they approach our Sun. This is due to what we call cometary activity. You can find comets in many places in the Solar System. Today we will focus on the 9 ones, which are located in the Main Asteroid Belt, i.e. between the orbits of Mars and Jupiter. This is the opportunity to present you Orbital alignment of Main-belt comets, by Yoonyoung Kim, Yougmin JeongAhn, and Henry H. Hsieh. This study has recently been published in The Astronomical Journal. Where are the other MBC? A comet is a small body, which presents some activity. This activity manifests as 2 tails, which are a gas tail and a dust tail. These two tails have different directions because the dust is heavier than the gas, and so is differently affected by the Sun. The Sun is actually responsible for at least part of this activity: if the body has water ice at its surface, the proximity of the Sun heats it enough to sublimate it. We distinguish different classes of comets, from their orbital motion. The short-period comets have a period below 200 years, i.e. they make a close approach to the Sun periodically, with less than 200 years between two approaches. This is for instance the case of the famous Halley comet, or 1P/Halley, which period is 75 years. The comets with a period smaller than 20 years are called Jupiter-family comets, their orbits are strongly affected by the gravitational perturbation of Jupiter. And we also have long-period comets, with periods larger than 200 years, up to several thousands of years, or even more… The extreme case is the one of the parabolic and hyperbolic comets, which eccentricities are close to or larger than 1. In such a case, we just see the comet once. The Jupiter-family comets should originate from the Kuiper Belt, and have been so strongly perturbed by Jupiter that their semimajor axes became much smaller, reducing their orbital periods. However, we attribute the origin of the longer periods comets to the Oort cloud, which is thought to lie between 50,000 and 200,000 astronomical units (remember: the Sun-Earth distance is 1 AU). The comets we are interested in today are much closer, in the Main-Belt of asteroids. Main Belt Comets (MBCs) are comets, which are located in the asteroid belt. As such, they present some cometary activity. It appears that there is no general agreement on the way to identify them. Some asteroids present an activity, which is mainly driven by dust, and not by sublimation of water ice, so it could be relevant to call them active asteroids instead of comets. But they may have some sublimation driven activity as well. 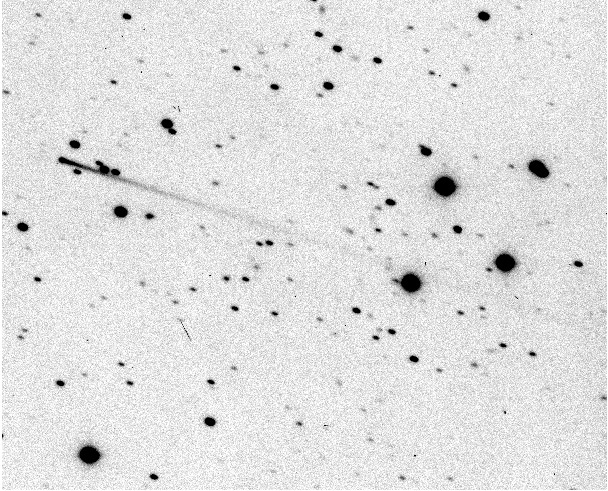 The first identified MBC is 133P/Elst-Pizarro, which has been discovered in 1979 and is since then identified as an asteroid… and also as a comet since 1996. I mean, this is officially both a comet and an asteroid. The authors considered 9 MBC, there could be a little more of them, since classifying them is not that easy. The MBC should originate from the Main-Belt. In this study, we are interested in the orbital dynamics. Let us talk about orbital elements. As I have already told you in a previous post, we usually describe the orbit of a planetary body with 6 orbital elements, which characterize the ellipse drawn by the trajectory. the ascending node, which locates the intersection between the reference plane and the orbit. We call them osculating elements. These are the elements that the orbit would have at a given time, if it were exactly an ellipse. The real trajectory is very close to an ellipse, actually. We will just keep in mind the two couples (eccentricity, pericentre), and (inclination, ascending node). Because these variables are coupled: without eccentricity, the pericentre is irrelevant, since the distance Sun-body is constant. And without inclination, the ascending node is irrelevant, since the whole trajectory is in the reference plane. And these variables are the sums of a proper and a forced component. Imagine you are a MBC. You want to have your own motion around the Sun. This gives you the proper (or free) component, which is actually ruled by your initial conditions, and the interaction with the Sun (what we call the 2-body, or Kepler, problem). Unfortunately for you, there is this big guy perturbing your motion (Jupiter is his name). He is heavy enough to force your motion to follow his. This gives you a forced motion, and the actual motion is the sum of the proper and the forced ones. The forced motion tends to align your pericentre and your ascending node with the ones of Jupiter. The authors studied these motions. And their conclusions is that the MBC are clustered, in particular the pericentres. They tend to be aligned with the one of Jupiter. This could have been anticipated, but the authors found something more: the MBC are more clustered than the others asteroids, which lie in that region of the outer main-belt. For quantifying this more clustered, they ran several statistical tests, which I do not want to detail (the Kolmogorov-Smirnov test, the F-test, and the Watson’s U2 test). These tests show that this excess of clustering happened very unlikely by chance. In other words, there is something. And this is more obvious for comets, for which the sublimation activity is overwhelming. This permits the authors to make a link between this activity, i.e. the presence of water ice, and this clustering. And to suggest favorable conditions for the detection of cometary activity for Main-Belt objects. Where are the other MBCs? Based on the result that the eccentricities of MBCs are secularly excited by Jupiter, the authors suggest to look for them in the fall night sky, when Jupiter’s perihelion is at opposition. We would not necessarily be looking for new bodies, but also for cometary activity of already known bodies. Because of the variations of the distance with the Sun, the sublimation of water ice is not a permanent phenomenon. Remember that Elst-Pizarro has been classified as a comet 17 years after its discovery. I would like to finish with a reminder that the Planet Nine was hinted that way, in 2016. A clustering among the orbits of Trans-Neptunian Objects was statistically proven. Since then, the Planet Nine has not been detected (yet), but other clues have suggested its presence, like the obliquity of the Sun. More generally, I would say that big objects strongly affect the orbits of small ones, and in observing the small ones, then you can deduce something on the big ones! You can find the study here, and a free version on arXiv, thanks to the authors for sharing! and the webpage of Henry H. Hsieh. Hi there! You know these large nuts called Brazil nuts? Don’t worry, I will not make you think that they grow on asteroids. No they don’t. But when you put nuts in a pot, or in a glass, have you ever noticed that the biggest nuts remain at the top? That seems obvious, since we are used to that. But let us think about it… these are the heaviest nuts, and they don’t sink! WTF!!! And you have the same kind of effect on small bodies, asteroids, planetesimals, comets… I present you today a Japanese study about that, entitled Categorization of Brazil nut effect and its reverse under less-convective conditions for microgravity geology by Toshihiro Chujo, Osamu Mori, Jun’ichiro Kawaguchi, and Hajime Yano. This study has recently been published in The Monthly Notices of the Royal Astronomical Society. The idea is easy to figure out. If you have a pot full of different nuts, then the smallest ones will be naturally closer to the bottom, since they are small enough to fill the voids between the largest ones. For the same reason, if you fill a bucket first with stones and then with sand, the sand will naturally reach the bottom, flowing around the stones. Flowing is important here, since the sand pretty much behaves as a fluid. And of course, if you put the sand in the bucket first, and then the stones, the stones will naturally be closer to the top. Well, this is the Brazil Nut Effect. OK, now let us make the story go one step further… You have an empty bucket, and you put sand inside… a third of it, or a half… this results as a flat structure. You put stones, which then cover the sand, lying on its surface… and you shake. You shake the bucket, many times… what happen? the sand is moving, and makes some room for the stones, or just some of them, which migrate deeper… if you shake enough, then some of them can even reach the bottom. This is the Reverse Brazil Nut Effect. And the funny thing is that you can find this effect on planetary bodies! Wait, we may have a problem… when the body is large enough, then the material tends to melt, the heaviest one migrating to the core. So, the body has to be small enough for its interior being ruled by the Brazil Nut Effect, or its reversed version. If the body is small enough, then we are in conditions of microgravity. The authors give the examples of the Near-Earth Asteroid (433)Eros, its largest diameter being 34.4 km, the comet 67P/Churyumov-Gerasimenko, which is ten times smaller in length, and the asteroid (25143)Itokawa, its largest length being 535 meters. All of these bodies are in conditions of microgravity, and were visited by spacecraft, i.e. NEAR Shoemaker for Eros in 2001, Rosetta for Churyumov-Gerasimenko in 2014, and Hayabusa for Itokawa in 2003. And all of these space missions have revealed pebbles and boulders at the surface, which motivated the study of planetary terrains in conditions of microgravity. I mentioned the necessity to shake the bucket to give a chance to Reverse Brazil Nut Effect. How to shake these small bodies? With impact, of course. You have impactors everywhere in the Solar System, and small bodies do not need impactors to be large to be shaken enough. Moreover, this shaking could come from cometary activity, in case of a comet, which is true for Churyumov-Gerasimenko. The authors studied this process both with numerical simulations, and lab experiments. The numerical simulations were conducted with a DEM code, for Discrete Element Modeling. It consisted to simulate the motion of particle which touch each others, or touch the wall of the container. These particles are spheres, and you have interactions when contact. These interactions are modeled with a mixture of spring (elastic interaction, i.e. without dissipation of energy) and dashpot (or damper, which induces a loss of energy at each contact). These two effects are mixed together in using the so-called Voigt rheology. In every simulation, the authors had 10,224 small particles (the sand), and a large one, named intruder, which is the stone trying to make its way through the sand. the restitution coefficient between the sand of the intruder. If it is null, then you dissipate all the energy when contact between the intruder and the sand, and when it is equal to unity then the interaction is purely elastic, i.e. you have no energy loss. Allowing those parameters to vary will result in different outcomes of the simulations. This way, the influence of each of those parameters is being studied. A drawback of some simulations is the computation time, since you need to simulate the behavior of each of the particles simultaneously. This is why the authors also explored another way: lab experiments. You just put sand in a container, you put an intruder, you shake, and you observe what is going on. Well, said that way, it seems to be easy. It is actually more complicated than that if you want to make proper job. The recipient was an acryl cylinder, put on a vibration test machine. This machine was controlled by a device, which guaranteed the accuracy of the sinusoidal shaking, i.e. its amplitude, its frequency, and the total duration of the experiment. The intruder was initially put in the middle of the sand, i.e. half way between the bottom of the recipient and the surface of the sand. If it reached the bottom before 30,000 oscillation cycles, then the conclusion was RBNE, and if it raised from the surface the conclusion was BNE. Otherwise, these two effects were considered to be somehow roughly balanced. But wait: the goal is to model the surface of small bodies, i.e. in conditions of microgravity. The authors did the experiment on Earth, so…? There are ways to reproduce microgravity conditions, like in a parabolic flight, or on board the International Space Station, but this was not the case here. The authors worked in a lab, submitted to our terrestrial gravity. The difficulty is to draw conclusions for the asteroids from Earth-based lab experiments. At this point, the theory assists the experimentation. If you write down the equations ensuing from the physics (I don’t do it… feel free to do so if you want), these equations ruling the DEM code for instance, you will be able to manipulate them (yes you will) so as to make them depend on dimensionless parameters. For instance: your size is in meters (or in feet). It has the physical dimension of a length. But if you divide your size with the one of your neighbor, you should get something close to unity, but this will be a dimensionless quantity, as the ratio between your size and your neighbor’s. The size of your neighbor is now your reference (let him know, I am sure he would be delighted), and if your size if larger than 1, it means that you are taller than your neighbor (are you?). In the case of our Brazil Nut experiment, the equations give you a gravity, which you can divide by the local one, i.e. either the gravity of your lab, or the microgravity of an asteroid. The result of your simulation will be expressed with respect to this ratio, which you can then re-express with respect to the microgravity of your asteroid. So, all this is a matter of scale. These scaling laws are ubiquitous in lab experiments, and they permit to work in many other contexts. The outcomes of the experiments match the ones of the numerical simulations. The authors saw practically no granular convection, i.e. the sand initially at the bottom does not migrate to the top. This is here an analogy with fluid mechanics, in which water at the bottom can raise to the top, especially when it warms (warm water is less dense than cold one). Densest intruders are the likeliest to migrate to the bottom. The authors identified 3 distinct behaviors for the particles, depending on a dimensionless acceleration Γ.
Fluid motion, which may induce RBNE. This is favored by rapid oscillations of the shaking. and the Kawaguchi Lab, which hosted this research. And that’s it for today! Please do not forget to comment. You can also subscribe to the RSS feed, and follow me on Twitter, Facebook, and (NEW) Instagram. Hi there! Asteroids, these small bodies in the Solar System, are fascinating by the diversity of their shapes. This is a consequence of their small sizes. Another consequence is their weakness, which itself helps to split some of them into different parts, sometimes creating binary objects, asteroids families… The study I present you today, Internal gravity, self-energy, and disruption of comets and asteroids, by Anthony R. Dobrovolskis and Donald G. Korycansky, proposes an accurate computation of the required energy to provoke this break-up, at any place of the asteroid, i.e. you are more efficient when you hit at a given location. This study has recently been accepted for publication in Icarus. Please allow me, in this context, to call asteroid a comet, a comet being a small body, i.e. like an asteroid, but with a cometary activity. The important thing is that the involved bodies are small enough. Beyond a given size, i.e. a diameter of ~400 km, a planetary body is roughly spheroidal, i.e. it is an ellipsoid with it two equatorial axes almost equal and the polar one smaller, because of its rotation. For a tidally despun body, like the Moon, or a satellite of a giant planet, the shape is more triaxial, since the tidal (gravitational) action of the parent planet tends to elongate the equatorial plane. The same phenomenon affects Mercury. However, for smaller bodies, the self-gravitation is not strong enough to make the body look more or less like a sphere. As a consequence, you can have almost any shape, some bodies are bilobate, some are contact binaries, i.e. two bodies which permanently touch together, some others are rubble piles, i.e. are weak aggregates of rocks, with many voids. These configurations make these bodies likely to undergo or have undergone break-up. This can be quantified by the required energy to extract some material from the asteroid. The shattering energy: the minimum energy needed to shatter the asteroid into many small pieces. It is part of the impact disruption energy. This energy is roughly proportional to the mass of the asteroid. It represents the cohesion between the adjacent pieces. The binding energy: this energy binds the pieces constituting the asteroid. In other words, once you have broken an asteroid (don’t try this at home! ), you have to make sure the pieces will not re-aggregate… because of the binding energy. For that, you have to bring enough energy to disperse the fragments. The self-gravitational energy: due to the mutual gravitational interaction between the blocks constituting the asteroids. Bodies smaller than 1 km are strength-dominated, i.e. they exist thanks to the cohesion between the blocks, which is the shatter energy. However, larger bodies are gravity-dominated. The kinetic energy of rotation: the spin of these bodies tends to enlarge the equatorial section. In that sense, it assists the break-up process. This study addresses bodies, which are far enough from the Sun. This is the reason why I do not mention its influences, i.e. the tides and the thermic effects, which could be relevant for Near-Earth Objects. In particular, the YORP effect is responsible for the fission of some of them. I do not mention the orbital kinetic energy of the asteroid either. Actually the orbital motion is part of the input energy brought by an impact, since the relative velocity of the impactor with respect to the target is relevant in this calculation. I now focus on the two cases studied by the authors to illustrate their theory: the asteroid Kleopatra and the comet 67P/Churyumov-Gerasimenko. 216 Kleopatra is a Main-Belt asteroid. Adaptive optics observations have shown that is is constituted of two masses bound by material, giving a ham-bone shaped. As such, it can be considered as a contact binary. It is probably a rubble pile. Interestingly, observations have also shown that Kleopatra has 2 small satellites, Alexhelios and Cleoselene, which were discovered in 2008. However, 67P Churyumov-Gerasimenko is a Jupiter-family comet, i.e. its aphelion is close to the orbit of Jupiter, while its perihelion is close to the one of the Earth. It has an orbital period of 6.45 years, and was the target of the Rosetta mission, which consisted of an orbiter and a lander, Philae. Rosetta orbited Churyumov-Gerasimenko between 2014 and 2016. 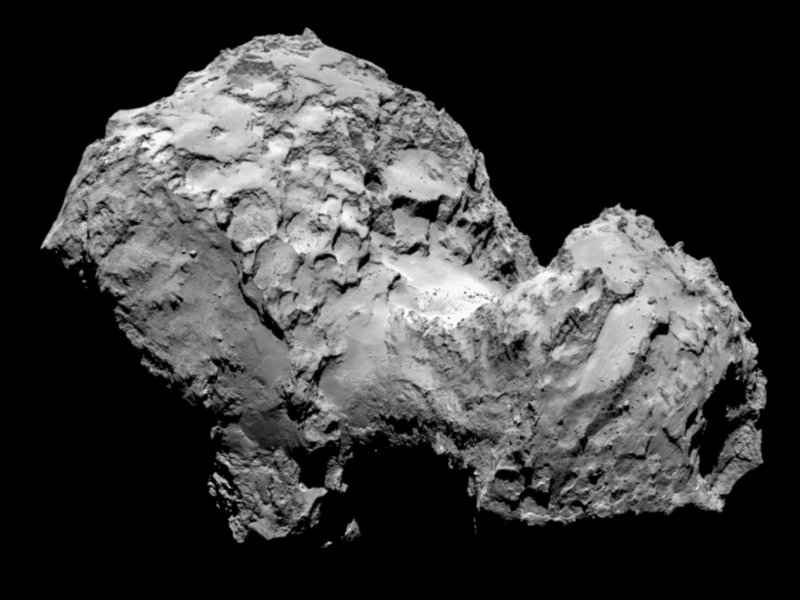 The shape of this comet is sometimes described as rubber ducky, with two dominant masses, a torso and a head, bound together by some material, i.e. a neck. The irregular shapes of these two bodies make them interesting targets for a study addressing the gravitation of any object. Let us see now how the authors addressed the problem. Several models exist in the literature to address the gravity field of planetary bodies. The first approximation is to consider them as spheres, then you can refine in seeing them as triaxial ellipsoids. For highly irregular bodies you can try to model them as cuboids, and then as polyhedrons. Another way is to see them as duplexes, this allows to consider the inhomogeneities dues to the two masses constituting bilobate objects. The existence of previous studies allow a validation of the model proposed by the authors. And their model is a finite-element numerical modeling. The idea is to split the surface of the asteroid into small triangular planar facets, which should be very close to the actual surface. The model is all the more accurate with many small facets, but this has the drawback of a longer computation time. The facets delimit the volume over which the equations are integrated, these equations giving the local self-gravitational and the impact disruption energies. The authors also introduce the energy rebate, which is a residual energy, due to the fact that you can remove material without removing half of it. This means that the impact disruption energy, as it is defined in the literature, is probably a too strong condition to have extrusion of material. The useful physical quantities, which are the gravitational potential, the attraction, and the surface slope, are propagated all along the body thanks to a numerical scheme, which accuracy is characterized by an order. This order quantifies the numerical approximation which is made at each integration step. A higher order is more accurate, but is computationally more expensive. Once the code has been run on test cases, the authors applied it on Kleopatra and Churyumov-Gerasimenko, for which the shape is pretty well known. They used meshes of 4,094 and 5,786 faces, respectively. The validation phase is successful. The authors show that with a 3rd order numerical scheme, they recover the results present in the literature for the test cases with an accuracy of ~0.1%, which is much better than the accuracy of the shape models for the real asteroids. Regarding Kleopatra and Churyumov-Gerasimenko, they get the gravity field at any location, showing in particular excesses of gravity at the two lobes. Such a study is particularly interesting for further missions, which would determine the gravity field of asteroids, which would then be compared with the theoretical determination by this code. Other applications are envisaged, the authors mentioning asteroid mining. and the one of Donald G. Korycansky.